The ultimate class for the Modern Muslimah who is ready to revolutionise her life by being unflinchingly consistent. This 20-part Online Course aims to show you the ropes on how to build better habits, fight the monsters of excuses, laziness and procrastination and firming up your Consistency muscle so that it will help improve all aspects of your life - spiritually, physically, mentally + emotionally! … Person A or Person B? Two people with the same 24 hours, started pursuing a new skill with the same capabilities and the same strengths. 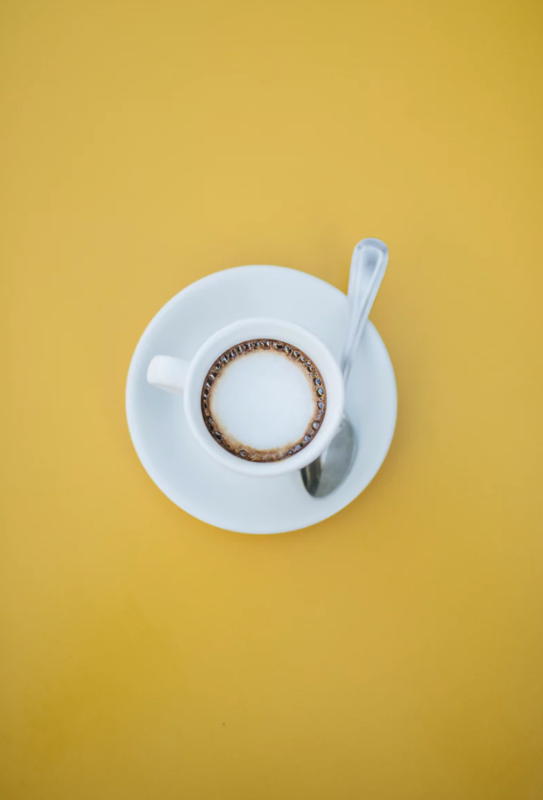 But Person A is crushing it - she’s seizing every new day as an opportunity for her to get better at her craft, little by little, while Person B is relying on her “mood” and “motivation” to get going. Person A grows steadily in small strengths, while Person B is dependent on her inconsistent spurts of intensity to move forward. Person A shows up, even when she doesn’t want to, but Person B waits (and waits and waits) for all her conditions and circumstances to be perfect. We all know how this story will end - it’s like the story of the hare and the tortoise - Person A will win the ultimate race and be excellent at her skill, while Person B will remain average, spiralling into regret for not putting in the effort to being more consistent. I used to be Person B for the longest time, until I realised that I will never win at life if I don’t start being consistent. I was tired of being mediocre, so I dedicated myself to learning how to master consistency. Consistency changed my life, and I can’t wait to show you how you can do the same for yours. ‘Master Consistency, Master Your Life’ is a 4 weeks Online course that aims to show you, step-by-step, on how to be unflinchingly consistent and how to apply Consistency to every aspect of your life - spiritually, physically, mentally and emotionally. It is conceived with the busy Muslimah in mind, with 20 succinct Audio lessons, (each episode no more than 15 minutes), that promises to take you by the hand as we go through each integral phase of building consistency; starting from the mindset, to the beginning of habit building, through the actual strategies of maintaining consistency and then finally, tying and connecting it all back to the Deen. Consistency is a skill that needs to be applied and practiced, so the course is created in such a way that it is not heavy on theory, but more focused on practical actionables that you can use to apply immediately in your day to day. This course will also be packed with plenty of real life examples so that you can easily relate and see how to immediately implement the tips and strategies in all aspects of your life, In Sha Allah. Because you deserve the best, most fulfilling life, and being adorably consistent helps you get there. We all want to lead better, happier, healthier lives. We all want to be closer to Allah and have the best relationships with the people closest and dearest to us. We want to be financially stable, make progress in our career and grow in our self-development too. I will not lie and say I have all the know-how to these noble pursuits, but what I do know is that being Consistent, and making small, but steady and persistent progress in all of the various aspects of our lives can make us feel more confident, at peace, and will bring us closer to living the life that we have always dreamed of. Consistency forces you to not settle, it pushes you to explore and hone your passions and interests, it strengthens your defence against laziness and procrastination, and it makes you feel…. so incredibly purposeful. It’s an incredible feeling, and once you’ve experienced it, you won’t want to go back to your old ways. I GUARANTEE IT! Consistency is the belt that fastens excellence in position. Salam! I'm Aida Azlin, and for the past 5 years I've been fully committed to helping ladies the world over to pursue Self-Betterment. I realised that the one pressing struggle that keeps coming up over and over again, and the one obstacle that most Sisters face when trying to make positive change in their lives is their lack of Consistency. Having struggled with it myself, I know how daunting building Consistency can be. But it’s absolutely do-able. Work-wise, I've been writing my Tuesday Love Letters, every week, for the past 6 years and have been shooting/editing/posting 3 Videos a week, for more than a year now - and this consistency has allowed me to build a mailing list that has over 48,000 subscribers, and Videos that have been watched a total of 3 million times. These were figures I never thought I’d reach if I wasn’t consistent. On the personal front, being Consistent has helped me strengthen my marriage, improve my health, and has definitely made me closer to my Creator as well. But I’m not special, nor gifted. I am just a regular girl from Singapore who has cracked the “Consistency Code”, Alhamdulillah. Let me share how you can too, in this Class! "Master Consistency, Master Your Life" is a 4 weeks Online Course that covers one main and central module per week. Each Module will have 5 sub-topics, and each sub-topic is meant to be listened to, daily, to build consistency. We will be releasing the first three sub-topics of the Week on Mondays, starting April 15th, and then the final two sub-topics of the week on Thursdays. The links to all Audio Lessons will be sent directly to your Inbox. Each Audio lesson will range between 15-20 minutes each and the entire course will have a total of 20 Audio Lessons. Even though Audio is the preferred medium, students will also be given full transcripts of each audio lesson should they prefer to read the content in accompaniment to the Audio lessons. For students who prefers visual aids, a Video with slides of the main points of each Audio Lesson will also be made available. Students will also be given an accompanying PDF Workbook each week with summary + notes of each lesson. At the end of every Audio Lesson, Students are tasked and encouraged to carry out one actionable / “heart work” relating to what they've learned. This is crucial as the aim of this course is for all of us to put into practice what we've learned about Consistency. What exactly are habits and how do they help us be consistent? We all have 24 hours in a day, but why can Person A do more than Person B? It’s not what we do once in a while that shapes our lives. All you need are sincere intentions and desire to make positive changes to your life, a working laptop / desktop /smartphone and a good Internet Connection! All Course Materials (Audio + Slides + Transcripts + PDF files) will be made available to download for an indefinite period of time so you can save the files and go over it at your own time and convenience. All Course Materials and news updates will also be sent straight to your Inbox for easy access. so that we can all do this, together. 1) Will the Online Class be held live? Do we have to tune in at a certain time for the classes? The Class is not time sensitive so there isn't a fixed time that you need to tune in. We release the lessons for the week at 2.30PM Singapore time on Mondays and Thursdays, starting from the 15th of April, and I will also be available 24/7 via email if you need any help. I will also be active in our secret FB Group where you can engage and share your questions and reflections with me, and also with the rest of the ladies that are in this journey too. We recommend listening to 1 Audio Lesson a day so that you can build consistency and have ample time to reflect upon the content and carry out the task that we've set for each lesson but if you work better listening to a couple of Lessons at one sitting, that's absolutely fine as well! The beauty of taking an Online Class is that you can work on it at your own time and at your own pace. You can pause, rewind, forward, re-start as many times as you want! You will also have a choice of listening to the Audio Lessons or watching a Presentation Video with the main points highlighted on Slides or read the full transcript - so wether you are an audio, video, or an all-text kinda person, we've got you covered! 2) Can we download the content of the course so that we can listen to the audio lessons offline? Of course! All of the content will be made available to download so that you can save it on to your computer / hard drive / phone for safekeeping and you can then have access to it forever (well, kinda forever!) and play it offline. 3) I don't understand how the Payment Plan works! Ahhh! Happy to explain how it works. The class amounts to $304 - which if you really divide it up among the 20 lessons is only $15.20 per lesson - but we are spacing it out and doing it in instalments over a period of 4 months as we've gotten a number of feedback from Sisters that the payment plan option helps them significantly - hence the $76 / month x 4 months! So for example, if you sign up and register on the 4th of April, then our system will automatically deduct the second instalment on the 4th of May, then the third instalment on the 4th of June and then the final instalment on the 4th of July. You don't even have to remember the dates - our system will do all the work for you! 4) I'm interested!! When does the registration end? And I don't have a Credit Card, can I pay via Ibanking / bank transfer? Yay, Alhamdulillah!! So happy that you have decided to join us! :) The Registration ends on Wednesday, 10th April, at 2359 HRS SG Time or as soon as we have filled up our slots. If you do not have a working credit / debit card, you can do a bank transfer to our Singapore account. Just email us at hello@aidaazlin.com and we will send you payment details in a jiffy! We believe that this course will add value to your life, so we are backing it with a 100% money-back guarantee. Participate in the first two modules from the start of the program and if you no longer feel that it is right for you, send us an email and we will refund your money back, with no questions asked. You have 14 days from the course start date to decide if you want to continue taking it - i.e. till 28 April. 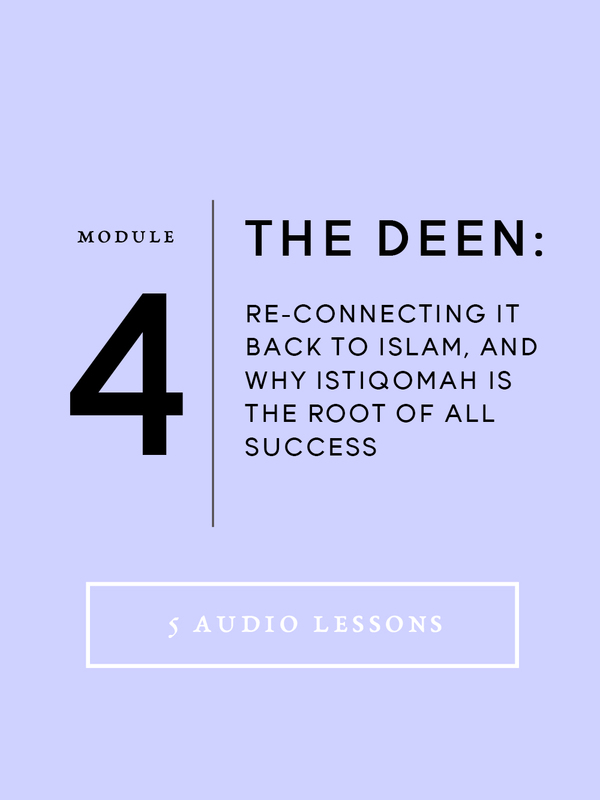 I believe that this class holds a lot of value, packed in bite-size audio lessons that are perfect for the busy Muslimah. All you need is 15 minutes each day, for the next 30 days (or less), and you can learn how to kickoff your Consistency journey and acquire knowledge to help you build a skill that will aid you for a whole lifetime. Bottom Line: This is the one program you need to master consistency, and master your life.